A wartime German built type 52 ‘Kreigslok’ locomotive (named at Bressingham ‘Peer Gynt’) has been on static display for many years. In recent times however it had become decidedly weather worn in appearance. 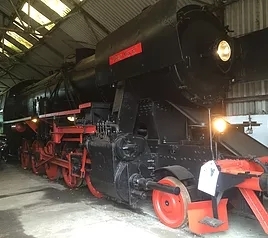 A small team of Bressingham volunteers undertook to repaint the locomotive in black livery, using Zinsser paint provided by Tor Coatings. The paint proved extremely effective, requiring in places only one application and this over corroded metal work.This locomotive is now cosmetically restored and on permanent display in one of our sheds. The cab is open to visitor access, with lighting and interpretation of the controls, so visitors can sit in the crew seats and imagine themselves driving this huge machine. This entry was posted in Repaint of German 'Kreigslok' - 'Peer Gynt' on 28th February 2017 by Tim Bridge.